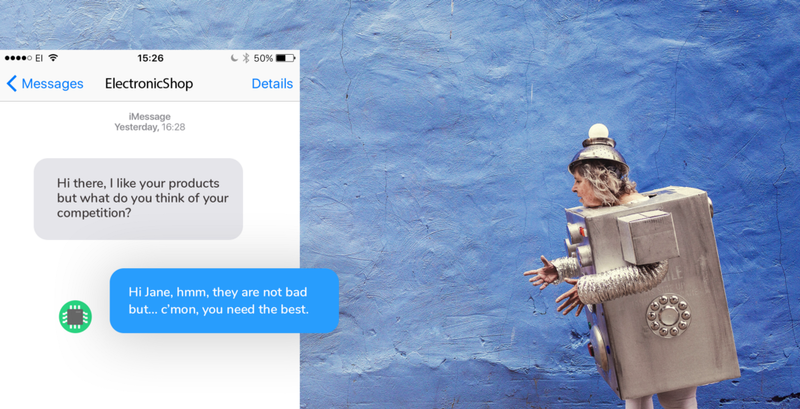 Should Your Brand’s Chatbot Have A Character? Why brands are doing their best to create personas over products. We’re living in a screen-obsessed world, spending on average 2 hours on social media and messaging services. But even if we’re tech savvy people, we’re still looking for more human interaction. The same is true when it comes to technology. The artificial intelligence trend is spreading far and wide. This is backed up by the McKinsey report which says that in 2016 companies invested $26B to $39B in A.I. and also by growing popularity of ‘no-interface’ trend. This direction has a huge effect of many branches of technology, esp. web or apps design, but mostly on the communication between brands and customers. That’s also one of the main reasons for chatbots’ increasing popularity. Most brands are doing their best to create them in a way that seems more persona than product. While creating a chatbot, many of us are mostly focused on the topic of a conversation. We think about which questions should be asked, when, and what answers make sense. Many companies forget to tailor the scenario to the specific situation with the specific customer. While customers are different, they have something in common – each of them demands a fully natural form of interaction with a brand. We are more willing to visit places where the service has a personable attitude and doesn’t use formal expressions. Currently, the main issue with chatbots is that customers tend to treat them as a robot and don’t feel comfortable during these conservations. As a result, sometimes customer service running bots is not necessarily faster or more attractive than other methods. Most people think that chatting with bots is only based on giving them commands. Creating a chatbot with a specific character is easier said than done. However, it’s crucial for modern brands. On the other hand, only chatbots with a clearly-defined personality are able to prove their intelligence and convince customers to talk with them in an honest way. Siri seemed to become jealous. Now we know that she doesn’t like when users mistake her name with another AI assistant. What is more, Siri’s reaction is in line with the Apple brand, which is known from its individuality. Therefore, we can definitely say that Siri has a character. Before you start to design your chatbots, you should go back the basics and thoroughly analyze all conversations with customers which have happened to date. Use all the sources you have, such as your live chat solution’s archives, contact center recordings and correspondences, if needed. The bot conversation’s scenario should be based on your knowledge about the customers. If not, your bot won’t be helpful for them. You should be fully aware of your customers’ languages, their questions and issues. On the other hand, you ought to analyze your customer service employees’ answers as well — which of them elicit positive or negative emotions from your clients. In first step, you don’t have to prepare the scenarios for all cases. Focus on these matters which are repeatable and your employees must answer them over and over again. Choose the conversations in which your customers were the most satisfied. Preparing the branches in a conversation tree should be based mainly on these experiences. There are a lot of ways to ask chatbots to make a reservation for a film in the cinema. But this number is limitless and certain keywords keep repeating. If the movie is mostly for millennials, try to add some common sayings for this target audience to the scenario. But note that a brand’s chatbot for millennials doesn’t have to always be a laid-back, immature twentysomething named Harry. Don’t try to create a chatbot which completely mimics your brand image. It should be your brand ambassador but not a member of your management board. Analyzing past conversations with your customers, you should know exactly which features your customers like the most during the conversations with your customer service employees. Next, do your best to implement them in the chatbots’ scenarios. When you’ve designed a bot, check several dozen times how the conversation runs. You have to be completely sure that the scenario is correct before you make it public. Observing advances in artificial intelligence, we may predict that in the nearest future chatbots will be one of the main things to manage in creating a company’s brand. They even have the potential to replace the traditional ‘user interface’, becoming something more crucial for human-brand interaction. I’m the Head of Research & Development at LiveChat. We’ve recently rolled out BotEngine, a chatbot factory that will allow any business to benefit from artificial intelligence. BotEngine beta version is now open and free to use. Should Your Brand’s Chatbot Have A Character? was originally published in Chatbots Magazine on Medium, where people are continuing the conversation by highlighting and responding to this story. Source: Should Your Brand’s Chatbot Have A Character?